After a month and a half, our café is working well, with lots of clients and friends coming by each day to eat vonblum style. The shop is now coming along nicely too. We are working with new designers, and that side of the project is growing. The newest additions to our space is the work of two lovely girls in Barcelona, Monica and Cuca. Monica is an illustrator, who makes magnets with local photos and her girls drawn in. She has had success in her gallery, and is now also available at vonblum. You can see her work in: her site and her blog. 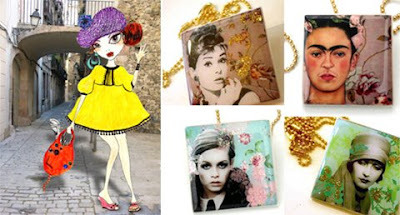 Cuca is a jewellery designer working with images of women who have inspired us. We are tempted to wear her creations ourselves, but are making efforts to leave some so that you can buy them too! You can see her work in: her site and her blog. I can say both artist are very talented. Their ideas are both unique! I love it.